It should come as no surprise that I love antiques, especially glassware, china, and the like. Among the collection are several pieces of Depression glassware, and the Madrid pattern has long been a personal favorite. It was manufactured by the Federal Glass Company from 1932-39 and offered the pattern in amber, green, pink, crystal and Madonna blue, the blue being the rarest. Amber is found most often and is a happy shade of yellow. The Indiana Glass Company purchased the Federal Glass Company’s molds when it went out of business and Indiana started manufacturing Madrid again, only adding the numbers “76” for the bicentennial and renaming it Recollection. They also added a few pieces that were not part of the original offerings. Unfortunately, Indiana later removed the “76” from the mold and it decimated the market for Madrid collectors because it became difficult to tell the difference between the original piece and the reproduction. While the market has somewhat recovered, the pattern, though almost universally loved by Depression glass aficionados, still has the “reproduction” stigma attached to it. Except for one piece, my collection is genuine Depression era glass. It is currently displayed in one of two glass cabinets in my kitchen. That one piece is a candlestick holder, and I knew when I bought it that it was of newer vintage. However, I wanted a match to the antique one I already had and the newer one was the same color as the antique. One of the things I love to do is set tables. Jamey calls it “playing with my dishes”. I have lots of fun setting the table, and here is my setting using Madrid. Sharp eyed Depression glass collectors will notice the different plate, which is Patrician. It was also manufactured by Federal, from the years 1933-37. It sometimes goes by the name of “Spoke”. 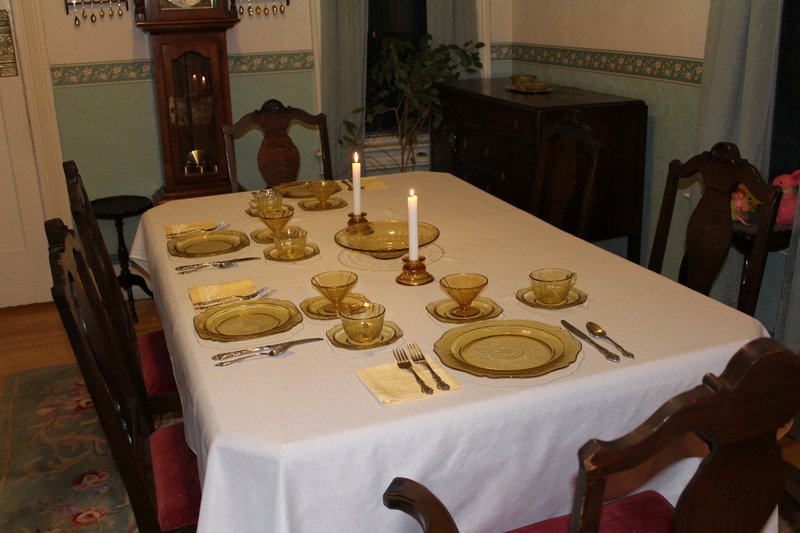 If you are interested, I have a Facebook page named Schon Decken-To Set a Beautiful Table. It is a private group, to avoid spammers, so if you want to see my beautiful table settings, you will have to request to join the group!